If you haven't caught festival fever in Dallas yet, this weekend will win you over. In addition to the final few days of the Dallas International Film Festival, there are multiple other festival-type events taking place, along with some world class soccer, theater in the great outdoors, a unique Easter celebration, and an appearance by a huge pop star. It will be another two years until the next Women's World Cup, but that doesn't mean you can't work up a little patriotic fervor as the U.S. Women's National Soccer Team faces off against Russia in an international friendly. The game, taking place at Toyota Stadium in Frisco, will feature players like Carli Lloyd, Alex Morgan, Megan Rapinoe, and more. In honor of The Statler's reawakening, Main Street Garden presents the Movies in the Park series. Beginning in the 1950s, the series showcases an iconic movie from each decade, making the way back to the future. The classic Elvis Presley movie Jailhouse Rock kicks things off, followed in subsequent months by Breakfast at Tiffany's, Superman, Ferris Bueller's Day Off, Forrest Gump, and Best in Show. Building on Dallas Theater Center’s unique approaches to Greek tragedies, audiences can expect the unexpected in this one-of-a-kind production that takes place outside at Annette Strauss Square. Electra’s mother murdered her father, and Electra just can’t let it go. With the return of her brother Orestes, the siblings seek justice … or is it vengeance? The production runs through May 21. The Deep Ellum Arts Festival celebrates its 23rd anniversary with a party covering six city blocks along Main Street, from Malcolm X Boulevard to Exposition Avenue. The adult-oriented festival, going on through Sunday, features more than 150 performances on both outdoor and indoor stages, more than 200 juried fine artists; dozens of concessionaires and local restaurants; street performers, jugglers, and other whimsical characters; and more. 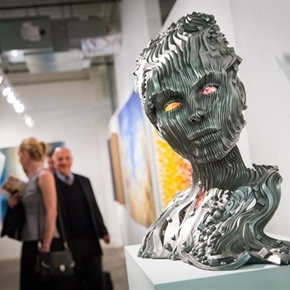 The 2017 Dallas Art Fair, taking place through Sunday at Fashion Industry Gallery, features over 90 galleries from 16 different countries, including new additions like Gagosian Gallery, Lehmann Maupin, Simon Lee Gallery, Skarstedt Gallery, and Shane Campbell Gallery. There's also the Dallas Music Experience on the FIG lawn, showcasing performances from Sam Lao, Blue, The Misfit, Sealion, Party Static, and Cygnus. Two of Dallas' favorite musical institutions, The Old 97's and HomeGrown Music and Arts Festival, have joined forces to create a festival experience unlike any other. The festival at Main Street Garden features performances by The Old 97's, Lucinda Williams, Mavis Staples, and others; a 40-foot Ferris wheel; corn dogs to hold you over until Big Tex is back; and plenty of opportunities to try your luck in the midway. Dallas Love Field presents a family-friendly Easter Egg Hunt and Carnival. The event, taking place at Dallas Executive Airport, includes an Easter egg drop from a Dallas Police Department helicopter, Easter egg hunt, petting zoo, train rides, bounce houses, food trucks, and a special appearance by the Easter Bunny. Each hunter is encouraged to bring his or her own basket to collect eggs. The Dallas Museum of Art presents a series of sponsored Family Days celebrating the once-in-a-lifetime exhibition “México 1900–1950: Diego Rivera, Frida Kahlo, José Clemente Orozco, and the Avant-Garde." Taking place every Sunday through May 14, Family Days features programs and activities inspired by the exhibition, along with free admission to the exhibit. Pop singer Ariana Grande has led quite the life for only being 23 years old. She starred on the Nickelodeon shows Victorious and Sam and Cat before transitioning into a full-time singing career in 2014. Each of her first three albums have debuted at No. 1 or 2 on the Billboard charts, and she's worked with everybody from Nicki Minaj to John Legend. She performs at American Airlines Center alongside Little Mix and Victoria Monet.